Nikon has announced what appears to be a new powerful point and shoot series in a time when P&S cameras sales have stalled. But this is more of a challenge to the Sony RX100 series from what I see, and they are banking on YOU liking it more than your smart phone for taking images! 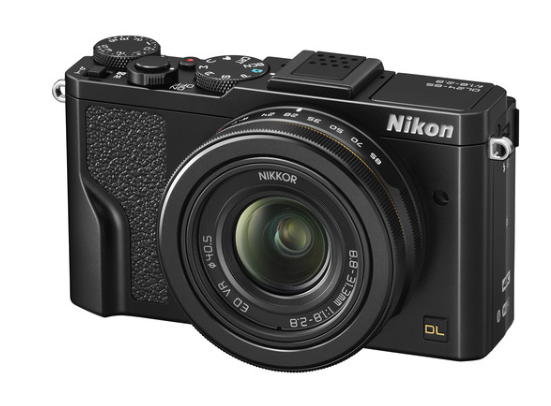 With a 1″ sensor (like the 1 series, CX) the new DL cameras are fixed lens point and shoots with a traditional Nikon look and feel. As they say, designed to look like a classic Nikon DSLR (of which I feel it certainly does not, but still has some charm) and give modern-day performance. The main competitor in my eyes for the new DL cameras is the Sony RX100 IV which is my fave pocket rocket P&S style camera of all time (digital). Below are the specs for the Nikon DL 24-85..what do you think? 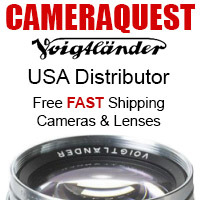 They also have a wide angle version that sports an 18-50 1.8 to 2.8 for just under $900. The 24-85 version comes in at $650 and they even have a monster zoom version (ala Sony RX10III) with a 24-500 zoom for a grand. You can see all of the Nikon DL options here, with specs, photos and all. The mid-range member of Nikon’s advanced DL series of point-and-shoots, the DL24-85 f/1.8-2.8 Digital Camera offers a versatile 24-85mm equivalent zoom lens paired with a 20.8MP CX-format BSI CMOS sensor to deliver stunning images in nearly any situation. This NIKKOR lens features a fast f/1.8-2.8 maximum aperture range that can create images with shallow depth of field and perform well in low light. Equipped with aspherical, ED, and HRI glass elements, this camera will capture images with the utmost clarity and minimal distortion and, thanks to a Fluorine coating, it will repel dust, water, and oil. Furthermore, this camera has a Super Macro Mode that can capture subjects at life-size and a Focus Bracketing feature to capture a sequence of shots with varying focus positions. Ensuring that all of this technology runs smoothly, quickly, and efficiently, the DL24-85 leverages the power of the EXPEED 6A image processor to produce crisp, clean stills and enables UHD 4K video recording at 30p. Paired with the 20.8MP sensor, the camera can work with sensitivities ranging from ISO 160-12800 and can operate an advanced Hybrid AF system with 171 focus points, 105 of which are capable of phase detection. This AF system can even be used during continuous shooting at up to 20 fps, though with fixed focus users can boost the camera’s speed to an incredible 60 fps. The camera’s body design is inspired by that of Nikon’s legendary DSLRs, with numerous physical dials and buttons throughout. This includes a command dial, rotary multi-selector, customizable function button, and a precision zoom ring, as well as a control ring that can be set to one of numerous functions. Ensuring composition is comfortable, the DL24-85 also features a 1037k-dot tilting OLED touchscreen. A built-in ND filter is available for working in bright light while using the fast maximum aperture. Additionally, it has full SnapBridge support with built-in Wi-Fi and NFC as well as Bluetooth Low Energy (BLE) technology for connecting straight to a smart device. Finally, it has a 24-pin hot shoe terminal for working with Speedlights as well as the optional electronic viewfinder. 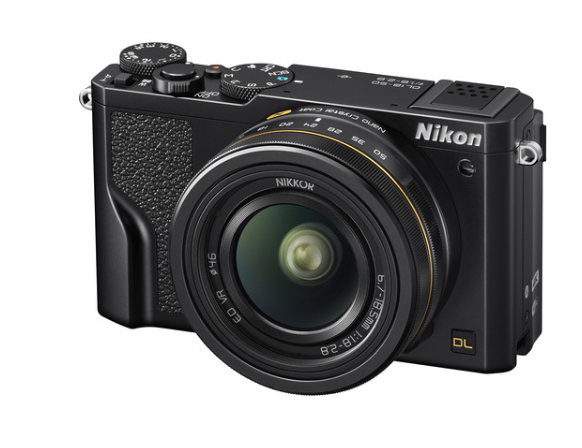 At the core of Nikon’s DL series is a large 1.0″ CX-format 20.8MP BSI CMOS sensor and the EXPEED 6A image processor. This pairing delivers high-resolution still and video shooting with low noise at sensitivities up to ISO 12800. Also, as the sensor forgoes the use of an optical low-pass filter, it guarantees the maximum possible resolution in the final image. This combination also boosts speed in nearly every aspect of the camera, including continuous shooting at up to 20 fps with autofocus or an astounding 60 fps with fixed focus. Featuring a versatile 24-85mm equivalent focal length, this NIKKOR 8.8-31.3mm lens makes the DL24-85 a convenient camera for everyday use, including portraiture and travel. Its f/1.8-2.8 maximum aperture range also benefits shooters by allowing shallow depth of field and capturing more light in dim lighting scenarios. Equipped with aspherical, Extra-low Dispersion (ED), and High-Refractive Index (HRI) glass elements to combat aberrations and minimize distortion, the DL24-85 will be able to capture spectacular, crisp images. There is even a Fluorine coating on the front element to repel dust, water, oil, and more. Furthermore, the lens has Dual Detect Optical VR image stabilization that can help compensate for up to 4 stops of camera shake and a Super Macro Mode allows photographers to capture objects at life size at a 1.2″ distance. And, it has an electromagnetic 7-blade aperture diaphragm for smooth out-of-focus elements. For the ultimate in high-resolution video capture, the DL series features internal UHD 4K video recording at up to 30p as well as the ability to output uncompressed footage over HDMI. The camera’s processing power effectively eliminates rolling shutter distortion and Auto ISO can smoothly adjust the exposure to fit varying lighting conditions. Other capabilities include a new Superlapse mode which lets you experience moments at double speed, time-lapse for condensing vast periods of time into just 10 seconds, and slow motion video for smooth capture of fast-moving scenes. The DL series cameras will also capture stereo sound via a built-in microphone. In addition to this exceptional resolution, the DL series can achieve high frame rates in Full HD at up to 120 fps for smooth slow motion capture. Fast options such as 240 fps and 400 fps are available at HD 720p and 800 x 296 resolutions, respectively, and for the ultimate slowdown, users can drop to 400 x 144 resolution for an incredible 1200 fps video. Capture some of the fastest-moving subjects with ease by using the DL-series advanced Hybrid AF which has a wide coverage area with a total of 171 focus points, of with 105 points are phase-detect capable for locking on to moving subjects. This also benefits the lightning fast continuous shooting speeds of 20 fps with full autofocus. Ensuring fast operation and DSLR-like performance, the DL24-85 has a variety of physical buttons and dials. This includes a command dial, rotary multi-selector, power switch, and a customizable Fn button. The lens has additional controls, including a precise zoom ring and a separate customizable ring that can be set for aperture, shutter speed, manual focus, or white balance. The rear of the DL24-85 sports a 3.0″ 1037k-dot OLED touchscreen can tilt up 180° for selfies or down 80° for working from multiple angles with ease. Additionally, the DL24-85 boasts a built-in flash for adding some additional light to your scene. Connect directly to a mobile device for remote control or image transfer by using the Nikon SnapBridge app, in combination with a DL series camera. These cameras offer numerous ways to connect, including the Bluetooth Low Energy protocol for constant connect between your devices. This allows the embedding of location, date/time, and two notes into your files. Along with this standard Wi-Fi and NFC is available for a variety of methods. Dedicated 24-pin hot shoe terminal allows the use of Speedlights and accessories like the optional electronic viewfinder. 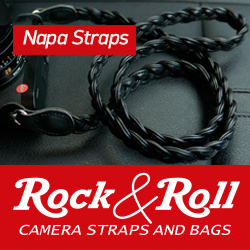 Raw image capture provides as much information as possible for post processing. Built-in ND filter good for 3 stops of light reduction. Creative Mode with five categories of customizable effects for creating a unique look for your stills and movies. Six Picture Control options allow you to achieve a signature look that can’t be reached through camera settings alone. Multiple Exposure Lighten setting for light trail images or time-lapse movies. Saves images to SD/SDHC/SDXC memory cards. Up to 4x digital zoom is available for boosting equivalent focal length to 340mm. What do YOU think of the Nikon DL? Sony RX100 killer or another yawn release from Nikon? I’m still waiting for a KILLER mirrorless solution from Nikon AND Canon as I feel that when they do finally come out with one (a serious one) it will be pretty special, at least I hope so! Amazon has the Nikon DL series available for Pre Order. They start shipping in June 2016. HANDS ON! First look and samples from the Sony 70-300 f/4.5-f/5.6 OSS FE Lens! The new Oberwerth MUNCHEN Camera Bag. Made in Germany. Why don’t you review this nice trio and give us a little comparison to the Sony offerings Steve? Not going to sell in big numbers. Carries the curse of the Coolpix A. Reduce the price by 50% and you may start selling them…..may. Next year is Nikon’s 100th Anniversary. I’m told we can expect some interesting and special products to coincide with that event. These DLs? They ain’t it. Àbsolutely right. Recent Kirk Tuck theater test = 200 rejects out of focus with the RX10 III, out of 1000 shots. With my V1 I rarely get more than 3-6 OF shots per 800 “frames” and these are due to user error, e.g., pointing the sensor dot behind the subject. For what I do, nothing can kill the Sonys unless it can duplicate or better their well-executed Picture Effect modes, particularly Illustration and Rich Tone Monochrome. But this is a very personal thing, and I fully expect serious photographers to disagree. Seems like an interesting effort, but before we know something about the performance it is just a nice face. Can’t figure out why it’s going to take several months, from the time of this initial introduction/review, until these hit the market? If the video is up to par, I’m in for $650. Great to see competition. Am on the 4th Sony RX100 as Sony owned this market segment. The zoom ranges offered by these Nikons are interesting and more exciting than Sony`s RX100III/IV. Sony will strike back, that is the good thing. A fast 24-100mm equivalent in a slightly bigger, more ergonomic RX100…. body with more manual controls would be interesting, something along the line of the Canon G5, but with Sony technology and Zeiss lens. The dxomark scores for 1″ sensors are not very impressive thus far when compared to aps-c, so I expect these to be a step backward from coolpix A in IQ, but zoom lens adds convenience. Given the prices of low end aps-c mirrorless and dslr nikon (and sony) are asking a high premium for small size and lower IQ. So far I’m not buying but obviously sony has done well with rx100 series so there is a market for p&s with IQ between cell phone and aps-c IQ. I will be surprised if the market is not saturated already, my guess is pricing will erode rapidly for both nikon and sony if these are close in size and IQ to the rx100 series. If these trail the rx100 they will hit the discount bin in a hurry…. When the bird and the book disagree, believe the bird. I don’t shoot DxOMark charts. I’ve had outstanding success with the CX sensor V1. See the first couple articles in the sidebar at http://www.livingwisdomschool.org. First Steps at Living Wisdom School, and A Day in Third Grade. Looks a bit like the pana Lx100, sans evf. Off-axis hotshoe is interesting, not that i imagine many would use a speedlight on these. It would put the add-on evf in a range-finder-ish location though. Free market competition is awesome! I believe Nikon has a nice EVF for these as well? Else they wouldn’t have peaked my interest. I’d never consider a camera without viewfinder. Have noticed these as well when they were announced, seems like a wonderful trio together just like the Sony RX offerings can be a nice mix and match as well. I’d expect the Sonys to be of a better build and image quality though. Meanwhile, my Pen-F arrived and I’ll be expanding that system. I have a Nikon P900 as well, couldn’t resist trying out that huge lens reach. Not the finest example of image quality though. Nikon had/has the chance to make Nikon 1 special, different, exciting but they keep messing that up with missing lenses and weird bodies and tiny batteries. Why on earth Nikon thought they could go head to head with Sony and the RX series I don’t know. More folly from Nikon IMHO. Sony would be extremely worried. They know the status of Nikon among photographers. The only advantage of Sony RX100 IV is built-in EVF. Hope to see next Nikon DL have EVF. I dont agree. 70 2.8 is to short focal length for ok portraits for a compact. Canon g7x with 100 2.8 kills the Sony, absolutly kills it when it comes to any kind of bokeh for portraits ( for a compact). Sony is to expensive now for what it is…. Completly agree with you. I hope m5 has better zoom range and lower price.